I'll just come right out and say it. Tonight was the most disappointing four-hands collaboration dinner I have ever attended. At a price just shy of HKD 3,300 ahead, inclusive of 10% service charge and a copy of the guest chef's book - and I had the pleasure of paying for 2 - that hurt. As has become standard practice these days, this particular collaboration was announced via a post on Instagram. Chef Richard Ekkebus posted the announcement about the #AmberHKxBorago collaboration, and I contacted him pretty much immediately to get myself a table. 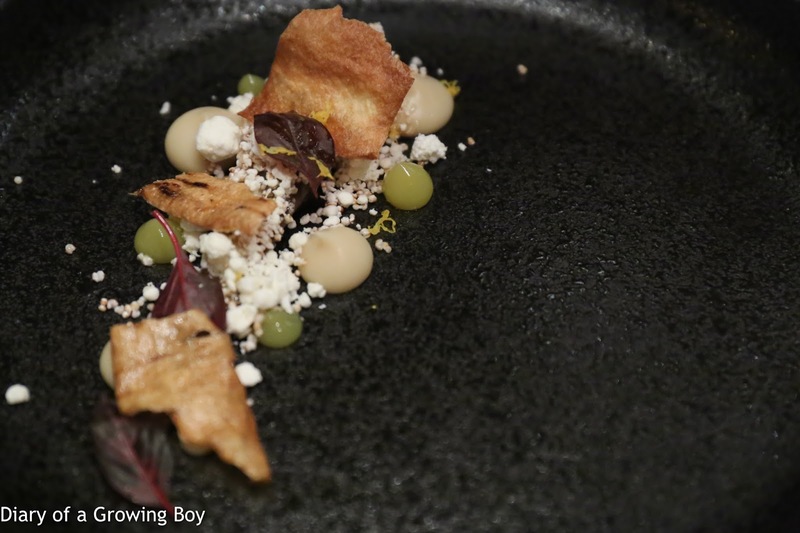 I'll fully admit that with a handful of exceptions, I haven't paid too much attention to restaurants and chefs from Latin America, so I didn't know anything about Chef Rodolfo Guzmán from Boragó in Santiago. But his restaurant currently occupies the No. 5 spot on Latin America's 50 Best Restaurants, and Richard clearly thinks highly enough of him to get him to come all the way here... so I felt pretty good about roping in a few friends for a night out. After all, we've had pretty good times at similar events here in the past. Richard came over to press the flesh while many of us were waiting at the Amber Bar before dinner. The poor guy has just had his third hernia operation a couple of weeks ago, and I can imagine that he's still in quite a lot of pain as his body tries to recover. Hopefully he can get some rest and recovery quickly. 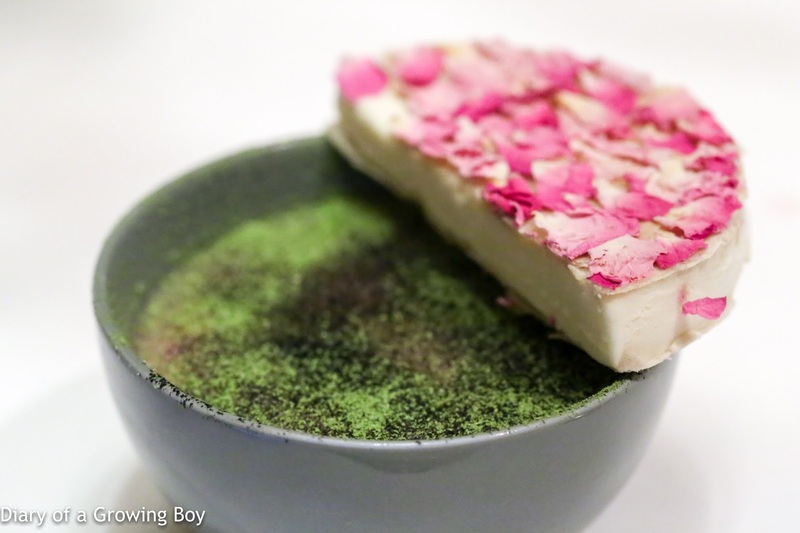 We were probably one of the last tables to get seated, and we were looking forward to getting some exposure to exotic ingredients foraged from far away lands - much like our first experience with Virgilio Martinez's cuisine when he first came to Amber when we were blown away. The kolof (we were told it was "koffier") had been heated up so it has now become dry and crunchy. (no remojar el cochayuyo in the kitchen, then...) As instructed, I made sure the bbc seaweed was well-covered with the white pajarito cream, licked a bit of the cream off with the tip of my tongue, before biting down delicately with my teeth and shattering the shaft in the process (the service staff warned us that it would "explode in your mouth"). 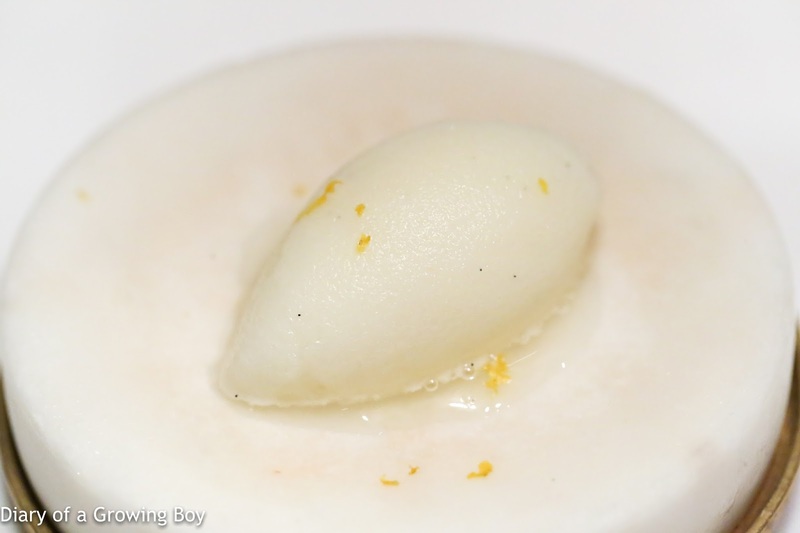 There was a nice bit of acidity in the cream, with lovely fragrance provided by the shaved yuzu (柚子) zest. I guess the schrenki caviar would provide the salty flavors of the ocean to accompany the relatively mild flavors of the seaweed itself. Chilenito of lobster - chilenitos are traditional sweets often filled with dulce de leche, but here we had a savory version. 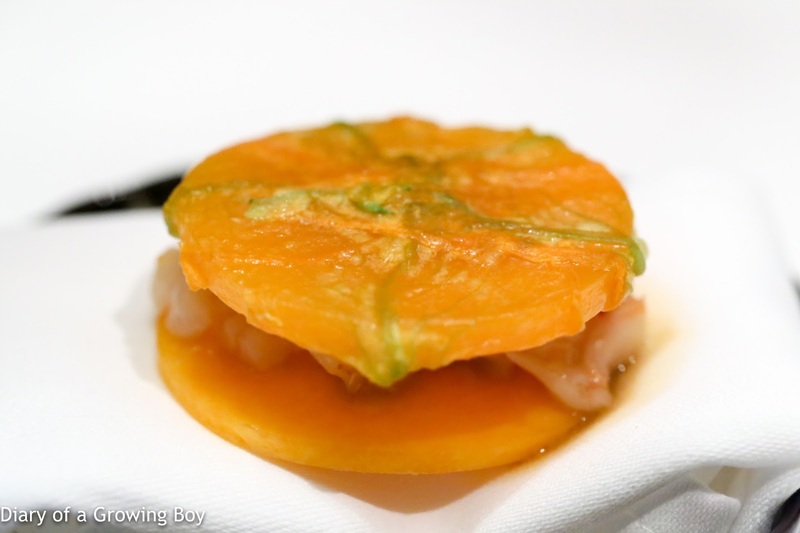 The bottom was a disc of "fresh" pumpkin while the pumpkin for the top disc had been fermented, and covered with a zucchini flower. The filling consisted of lobster meat. I took this "sandwich" in one bite then slowly broke it apart in my mouth, albeit with some difficulty. There was no explosion of flavors as I had expected. 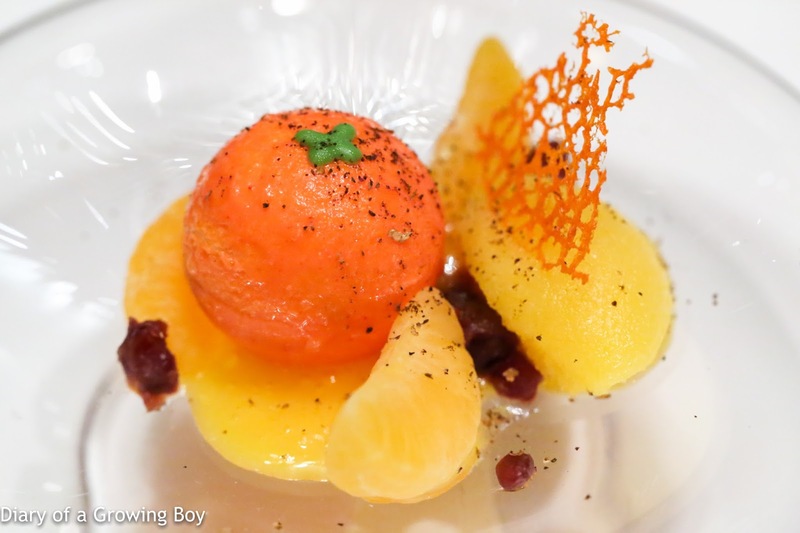 I tasted the natural flavors of the ingredients, and nothing beyond that. Dare I say that this seemed a little bland? My compatriot felt like he was eating the slice of carrot often placed underneath the xiaolongbaos (小籠包) to prevent them from sticking to the steamers, and while we chuckled a little... I couldn't say I disagreed completely. Sardine lightly cured with yellow beets, caviar lime, horseradish cream and dill - very pretty finger food. 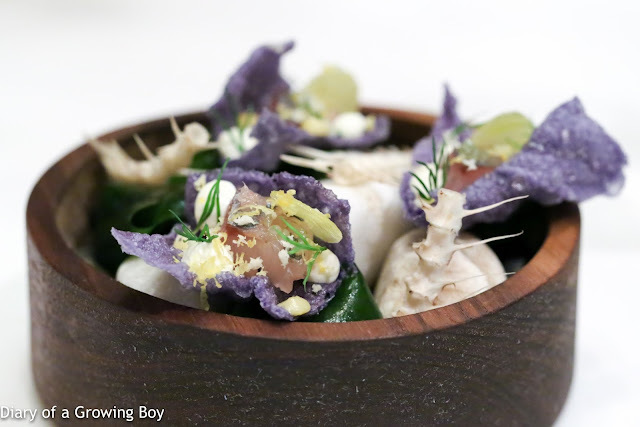 The purple potato chips carried little chunks of cured sardine, along with little discs of yellow beetroot, horseradish cream, finger lime caviar and a bit of dill. This little mouthful sure was tasty! 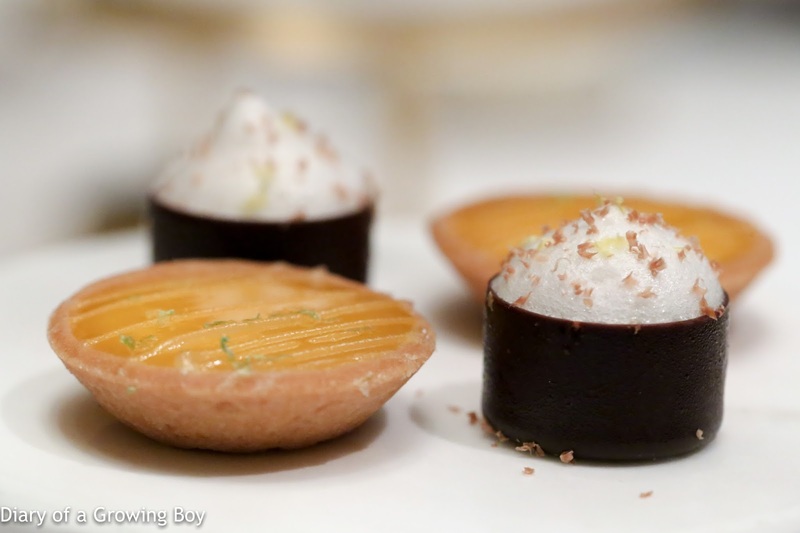 The fragrance and acidity from the finger lime was especially prominent. 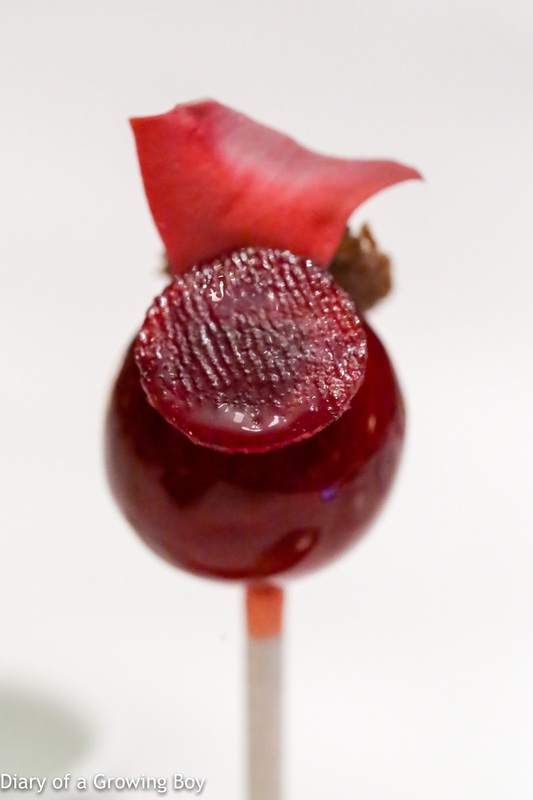 Foie gras chupa chup with beetroot and raspberry topped with crispy gingerbread and sea salt - an Amber 'classic' which has made a recent comeback. The foie gras was as smooth as I remembered. The acidity from raspberry in the coating balanced the richness very well. 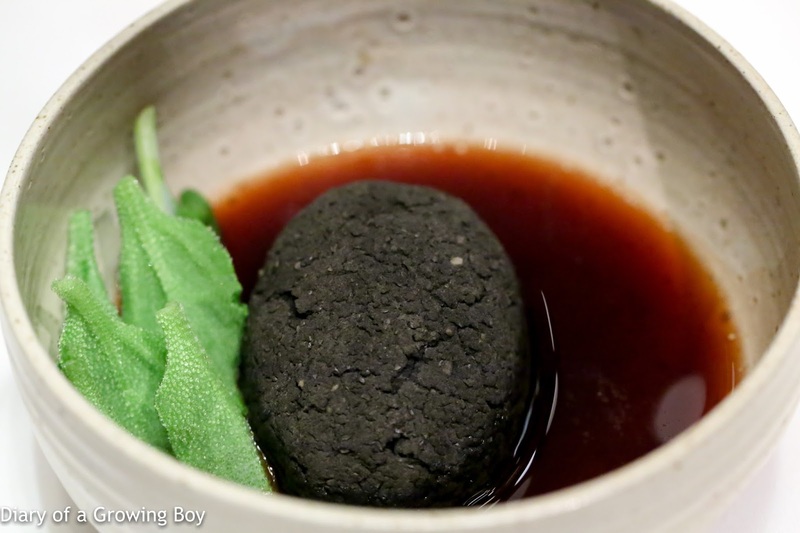 So we have a black "rock" made with a paste whose ingredients include, among others, sea/beach beans and squid ink. I still have no idea what sea or beach beans are, but I felt like I was eating some Mexican refried beans with a hint of spices. 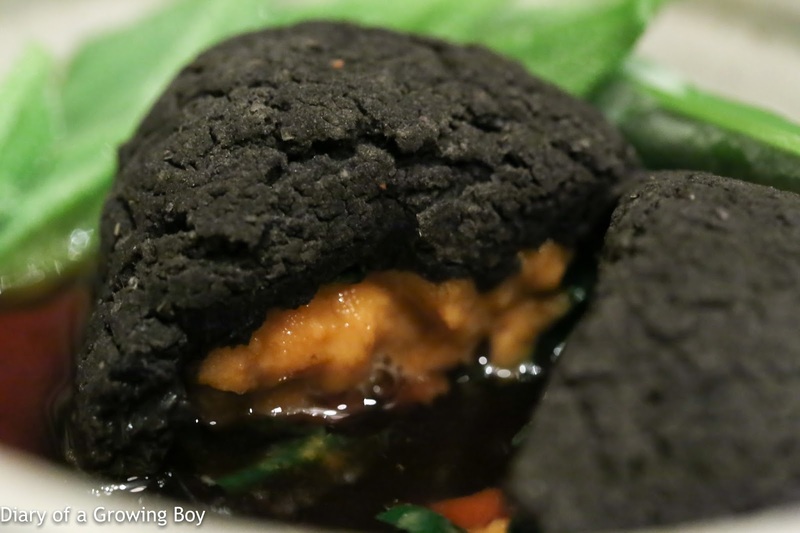 Encased inside the blackish bean paste were tongues of sea urchin wrapped in spinach. 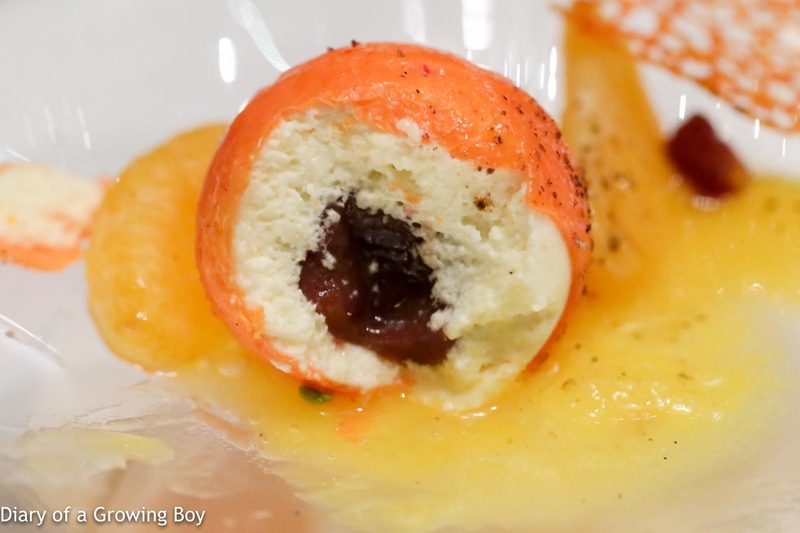 Unfortunately, the bean paste kinda masked the beautiful sweet and creamy flavors of the sea urchin. The broth that was poured into the bowl was made by boiling kolof root which, I guess, made it kinda similar to konbu dashi (昆布出汁). 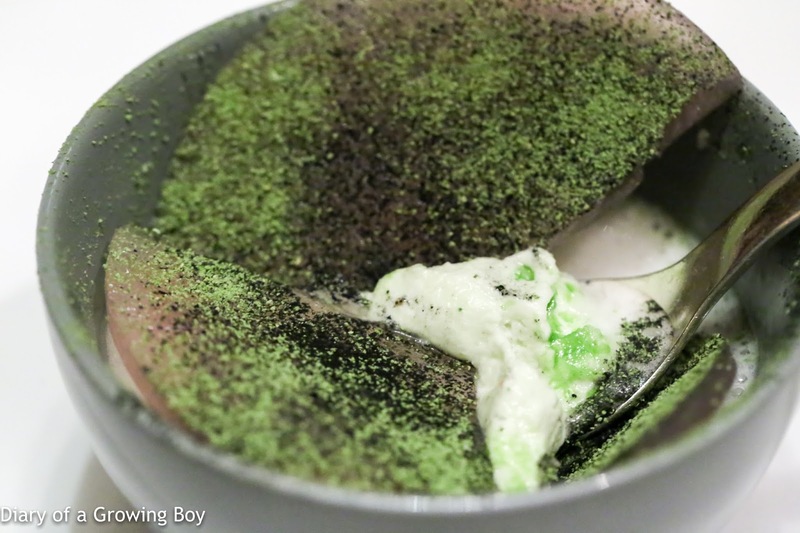 The ice plant leaves on the side delivered even more flavors of the sea. 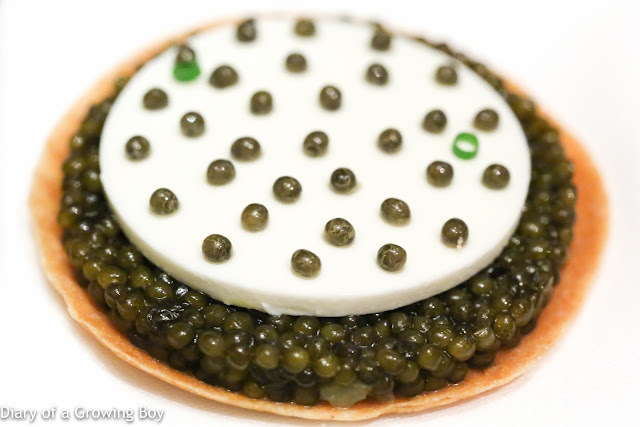 Kristal schrenki caviar: leek, crème fraiche and feuille de brick served like a fine tart, by Amber - aaaaah... the familiar sight of Richard's caviar tart. 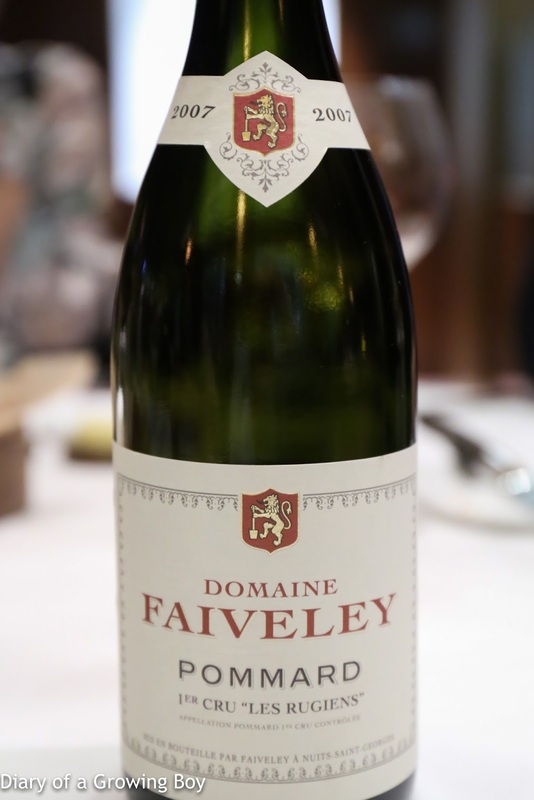 I first had the pleasure of tasting a mini version of this at this 4-hands dinner last year, then Richard was kind enough to send us the full-size version for Hello Kitty's birthday a few months later. Once again I loved the fragrance of the feuille de brick pastry, which hit me as soon as I brought the tart close to my nose. 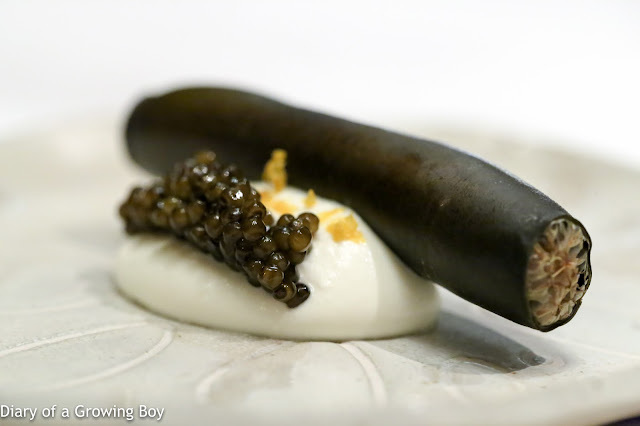 Having a whole 20 grams of sturgeon caviar - and these days farmed caviar from China are among the favorites of top chefs around the world - was pretty decadent. The disc of crème fraîche provided the perfect counterbalance. Fish head cooked al rescoldo and sea carrots beurre monte, by Boragó - so... when this was first brought to the table, we thought it looked like a ciabatta sandwich that we could just pick up and bite into. Nope. 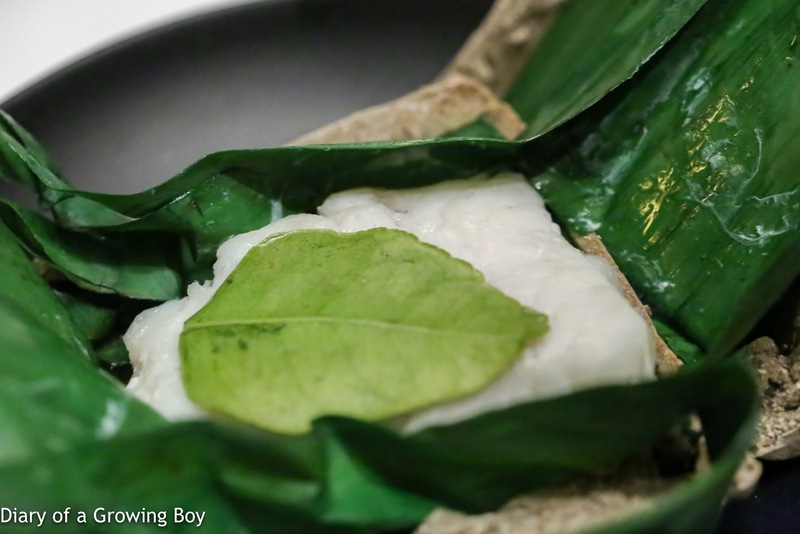 Turns out we needed to open it all up, unwrap the banana leaf and remove the lime leaf to get to the young wild turbot. We were then meant to lift the turbot and place it in the in beurre monte. Served with salsify and organic kailan (芥蘭). 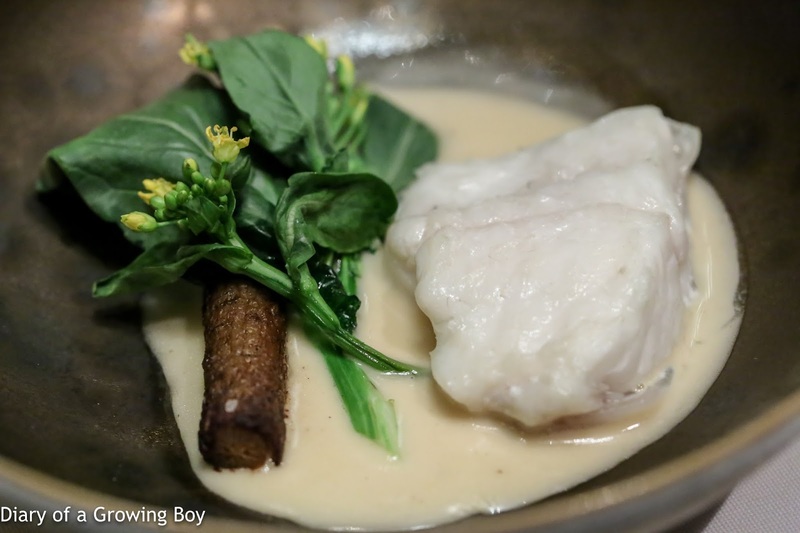 The turbot itself was fine, if a little bland without the beurre monte. Unfortunately, my piece came with quite a few small bones... which I'm pretty sure wasn't meant to happen. Organic parsnip: miso marinated and char grilled, its skin crispy-fried with solidified extra virgin oil, yuzu gel and amaranth, by Amber - served with crispy amaranth seeds and amaranth leaves. Not a fan. It was salty and acidic, but I found it really uninspired. Duck aged in beeswax, hearts and murra emulsion, by Boragó - one of the signature dishes. Unfortunately our waitress once again failed us, and kept telling us that the sauce was "fuji sauce". Well, it wasn't. It was made with elmleaf blackberries (murra). 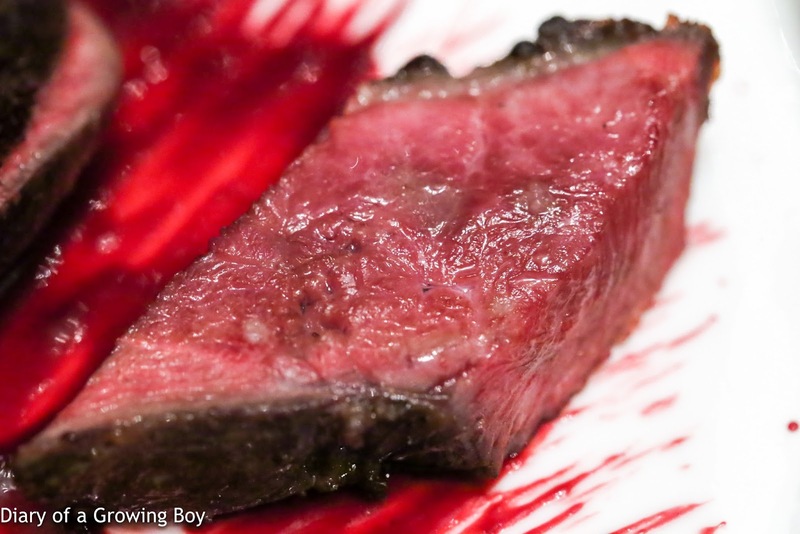 The duck was aged in beeswax with ulmo honey, which gave it a much deeper, almost fermented flavor. The pieces of duck and duck heart were covered with wilted plum leaves. 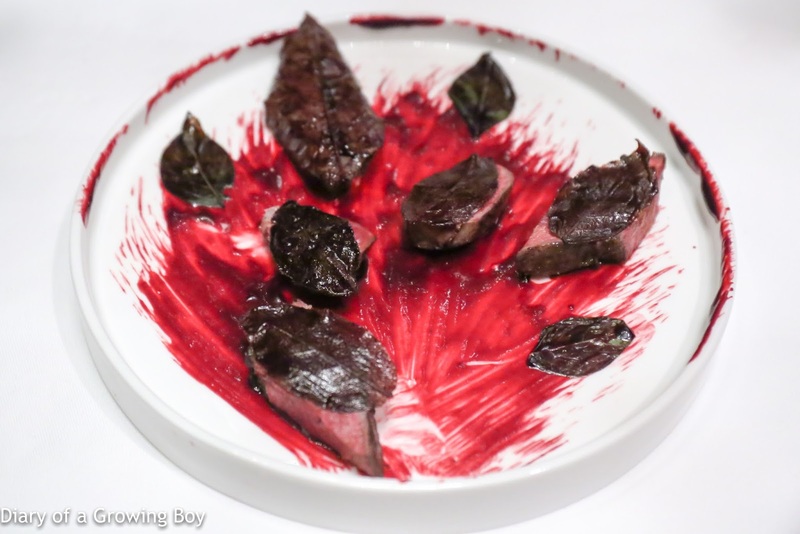 The whole presentation kinda hit us with a "bloody" impression, especially when duck heart is on the plate. Hakoo Farm Miyazaki wagyu beef strip loin: dusted with dried red onion skin and dulse seaweed powder, red pearl onions with blackcurrant in a shiraz reduction, by Amber - this is gonna sound like #firstworldproblems, but when I saw that this was on the menu, the first thing I could think of was "but... didn't we have the same dish at that 4-hands dinner we went to last year?!" To be fair, the dish is delicious. The A5 Japanese wagyu showcased the marbling perfectly. 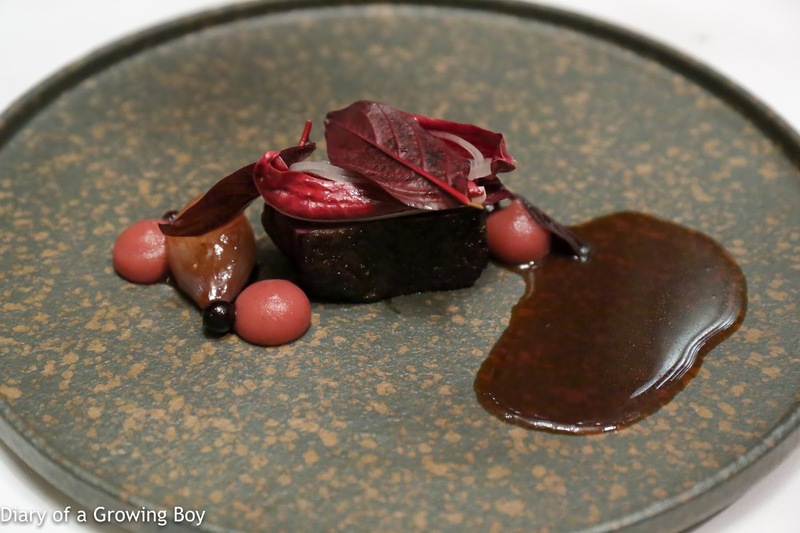 The acidity from blackcurrant and radicchio helped cut the richness of the dish. 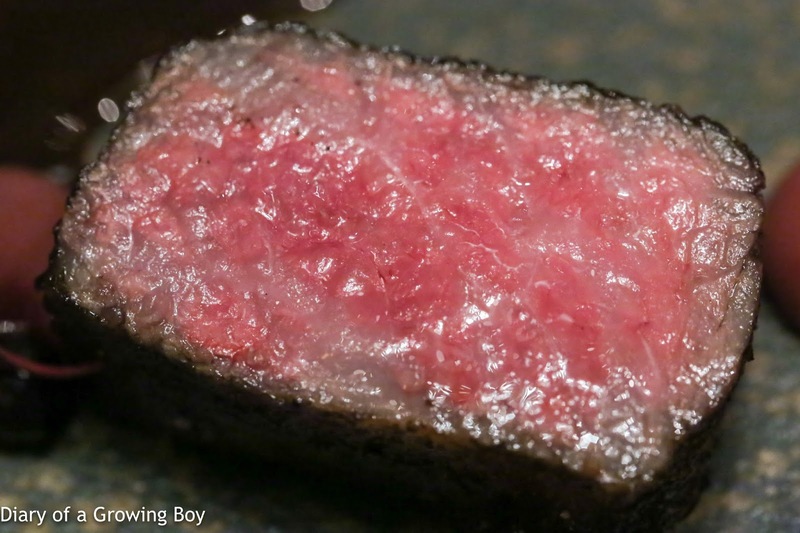 Most people would be perfectly happy eating this piece of beautiful Japanese beef. I just found it boring to see it on the menu time and again, and preferred if Richard had chosen to us something a little more interesting. The 'ice brûlée' came with a layer of ice on top, which we had to crack with our spoons. What we had to look forward to below the ice turned out to be nothing short of misery. 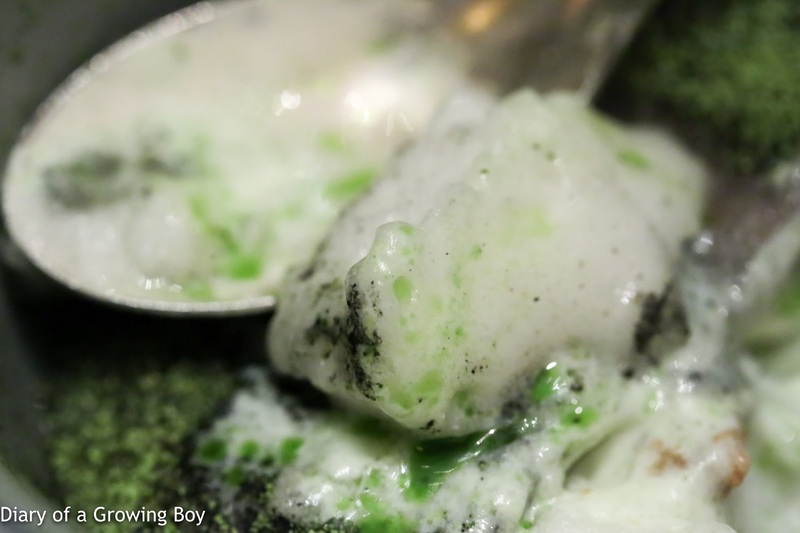 While initially I wasn't too bothered by the acidity of the lemon verbena foam, it wasn't long before I began wincing like the others at the table when I dug deeper. 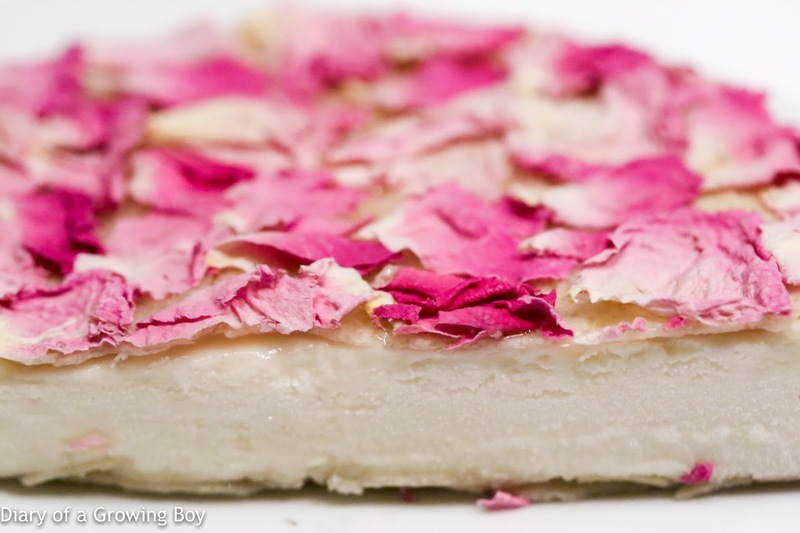 The combination of cold cream and foam was just bitter - thanks to Rodolfo's fondness for using native plants of the Atacama Desert such as rica rica, muña muña, and tolilla - all of which have bitter flavor profiles. It also tasted like wax or pine needles. Even the chunks of pear had been cooked in tola - yet another bitter-tasting plant. The second part of the dessert was an ice cream sandwich we were asked to set aside, so that it could warm up and soften while we spent time on what was in the bowl. This turned out to be the best thing Rodolfo delivered tonight. The layer of 'rose of the year' - which blooms in the desert after heavy rains once in a blue moon - was simply beautiful. Out of everything on the menu tonight, this seemingly simple ice cream sandwich delivered the most amount of happiness for me. That may or may not have had anything to do with how utterly pissed off I was a mere minute before I took my first bite of it, as I was pondering and looking for a reason to rationalize why I had been served the ice brûlée. This basically lifted my spirits up from the depths of hell up into the heavens. Corsica clementine segments, sorbet and reduction with an adzuki red bean crémeux and table side ground timut peppercorns, by Amber - I love me a citrusy dessert, and interestingly they've decided to add some azuki (小豆) beans into this mix - stuffing into both the clementine mousse as well as having it in the bowl alongside the sorbet and wedges. Personally I would have been happier without the beans. Yuzu sorbet with vanilla - pretty acidic. 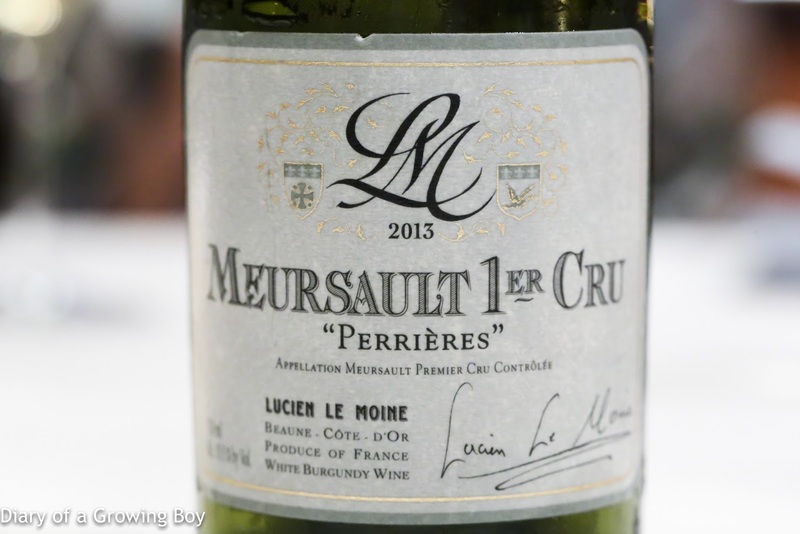 My compatriot and I combed through the wine list trying to find some bargains, while the sommelier tried to be helpful and suggested a few bottles I found rich. So I chose a bottle of white I felt like drinking and my friend picked the red. Near the end of the evening, Richard came over with Rodolfo for the usual meet-and-greet. 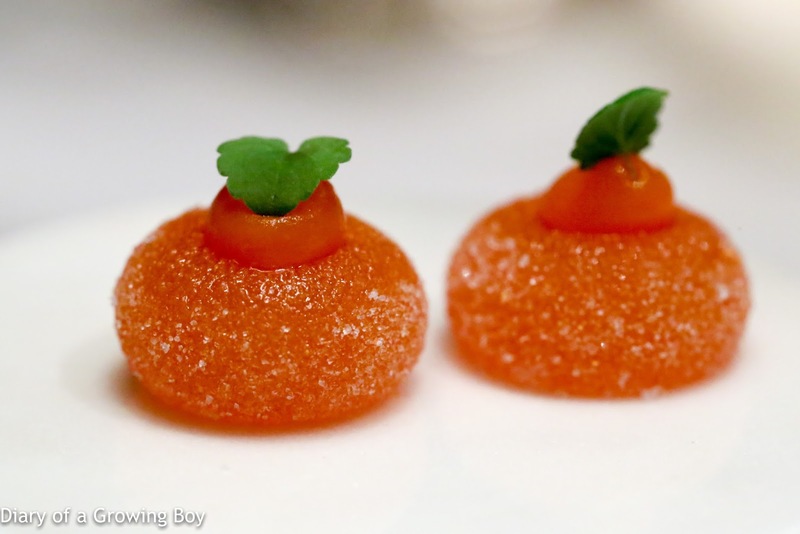 Gaggan Anand had left me a message asking me to give them both hugs, which I did dutifully. I didn't have the heart to tell Rodolfo how much we didn't enjoy his cuisine... Maybe we just didn't "get" his cuisine... and truth be told, 4-hands dinners where you're the guest chef also put you at a disadvantage. Hopefully the next one will be better.